A weakening economy might have been in the news for months now, but the results of <i>RCP</i>'s second annual salary survey show that a possible recession isn't yet hitting partners' pockets. In fact, on the whole, executives at partner companies are doing better than they did in 2007 -- and high demand for their skills may keep that trend going. Never mind the scary news reports; disregard all the speculation. Forget trying to figure out whether the economy is in recession, near recession or just slowing. Go out and buy that new gas grill or take the family on vacation. Spring for those season tickets. Spiff up the wardrobe a bit. You've earned it, Microsoft partners-and, apparently, you can afford it. Regardless of an economy that continues to show signs of shakiness, Microsoft partners are collecting fatter paychecks in 2008 than they did in 2007, according to the results of RCP's second annual salary survey. Over the past year, just about everything has gone up -- raises (by dollar figure and by percentage), bonuses, even hourly consulting rates. It's not unusual, of course, for salaries to increase-many companies give employees annual cost-of-living bumps, and inflation can actually lower employees' wages from year to year if they don't receive a corresponding boost in pay. But with pundits talking recession (and with RCP addressing that issue in our May cover story, "Staying Afloat"), the extent to which the numbers jumped was actually somewhat surprising. In 2007, when RCP conducted its first salary survey for Microsoft partners-and, as far as we know, the first of its kind ever -- you reported some pretty impressive numbers: average salary of $85,275, median salary of $77,500, an average raise of 4.9 percent per year and average annual bonuses of $8,909. As it turned out, all of that was nothing -- at least in comparison to the numbers you racked up in the 2008 survey. Let's look at those four figures again, this time with this year's numbers: average salary, $92,119; median salary, $84,000; average raise, 5.44 percent; average annual bonus, $10,005. To put it mildly: cha-ching! Mo Edjlali, CEO of TalentFamily Inc., a Fairfax, Va.-based recruiter of Microsoft specialists and Certified Partner, says that his observations jibe with RCP's survey results. "We've definitely noticed that, across the board, salaries have gone up," Edjlali says (see "Mo Money"). Numbers were up generally across the board, but they weren't all static. Salaries by partner category fluctuated from 2007 to 2008. 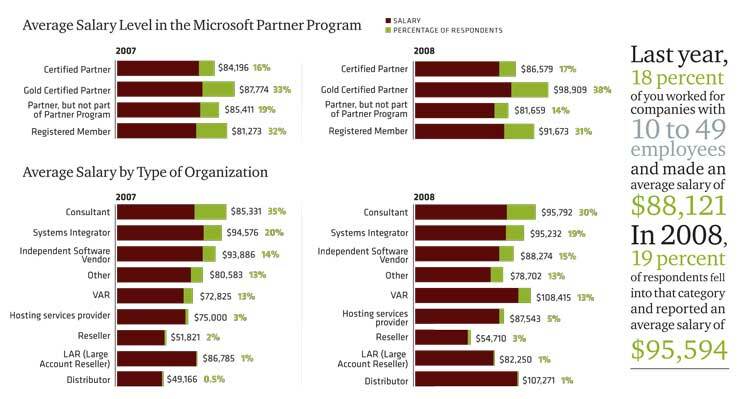 For instance, Gold Certified Partners were still the best compensated of those surveyed in terms of Microsoft Partner Program level. But Registered Members, who finished last a year ago, leapfrogged Certified Partners and partners who aren't formally members of the partner program to finish right behind their Gold Certified Partner counterparts. Distributors, by far the lowest-paid respondents by type of organization in 2007, jumped into second place in 2008 with an average salary that exceeded six figures. This year's champion in that category was independent software vendors, who soundly beat out systems integrators -- last year's high earners in the category. Business owners who aren't sole proprietors were among the few groups to come off a bit worse in this year's survey. They shed more than $6,000 per year on average -- perhaps signaling that they're paying themselves less in a tightening economy, or maybe just reflecting that respondents to this year's survey were different from those who took the survey last year. Overall, by role, co-owners or part owners of companies bucked the tight economy and made out best, topping six figures on average. Self-employed partners did very well, too, and rounded out the top three-along with business owners and the self-employed -- in terms of earners sorted by personal role. Full-time employees at partner companies, who represent the bulk of our respondents, enjoyed an average salary boost of more than $6,000 per year and topped $90,000 per year on average. By title, CEOs and chairman weren't the richest respondents to the 2008 survey. Their titular underlings -- other C-level executives -- earned that distinction by a significant margin of more than $20,000 per year on average. Vice presidents slotted in behind their C-level (but non-CEO) counterparts. As for CEOs, they actually saw their average number drop by more than $10,000 per year. Experience with a particular company was much less of a factor this year than last, with partners reporting one and two years of experience with their companies both topping six figures on average. Only partners with 20 to 24 years of experience did better. It seems possible that some high-ranking, highly compensated people might have moved to new companies and grabbed large salaries in the last couple of years because experience in the industry as a whole is still highly important. 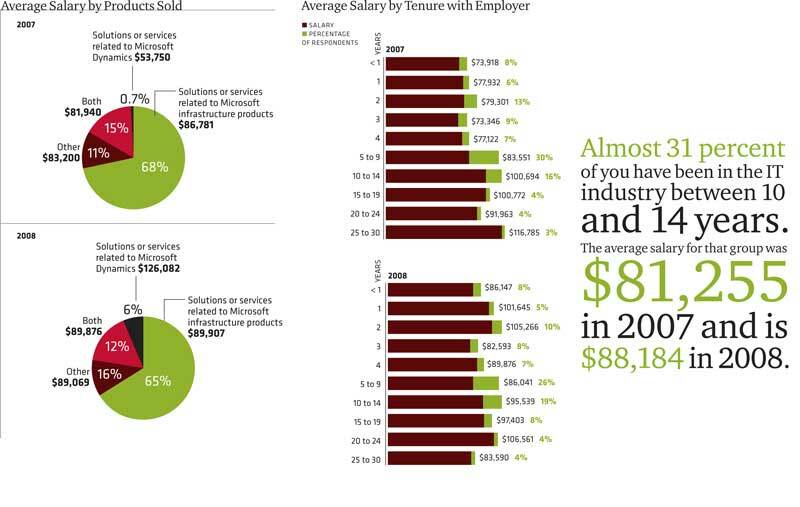 The survey showed -- much more strikingly this year than last -- that respondents with more than 15 years of industry experience did considerably better salary-wise than their greener counterparts. 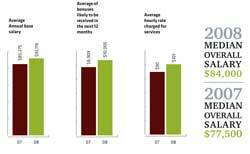 By the same token, respondents aged 60 and older reported making more money than their younger counterparts. The 60-plus age group was, as it was last year, the only group to top six figures in annual salary. In 2007, partners from larger companies mostly made more money than their counterparts from smaller businesses. Not so in 2008. Respondents from companies with 100 to 249 employees -- solidly in the small to midsize business (SMB) space -- actually topped the money list. Similarly, respondents from companies that have $10 million to $49 million in annual revenues did very well, nearing six-figure average salaries and finishing behind only respondents with companies that have $1 billion to $4.9 billion in annual revenue, as well as those with $10 billion to $24.9 billion. The numbers seem to indicate that SMBs, which may not be able to offer the same types of perks or prestige as larger companies, are attracting employees with that most tangible benefit of all: money. Across the board, in fact, partners got bigger raises than they reported getting in 2007. The average annual salary increase was less than 5 percent last year; this year, it was almost 5.5 percent. Bonuses got fatter, too, topping $10,000 on average after coming in at not quite $9,000 last year. And for those intrepid consultants who charge by the hour, their time was more valuable in 2008 than it was the year before, the numbers show. Their hourly rates jumped, on average, from $90 to $101. Mo Edjlali isn't feeling the results of an economic downturn. In fact, he's seeing his clients -- which include Microsoft partner companies -- dish out more and more money for qualified professionals. Edjlali is CEO of TalentFamily Inc., a Fairfax, Va.-based recruiter of Microsoft specialists and a Certified Partner. He says that the rise in partner salaries is easy to explain: "It's supply and demand." Well, it's a little more complicated than that -- but not much. A dearth of people with competencies in new Microsoft technologies is driving salaries higher, Edjlaji says-and leading the list of those technologies that need specific expertise is SharePoint. "In certain areas, places like SharePoint, we've seen a much more significant increase" in demand, he says. "It really matches up to Microsoft's growth areas. Someone with one or two years of experience in SharePoint, if they've got the right hands-on experience ... even if they graduated college two years ago, if they've been doing nothing but SharePoint and they're good, they can demand $85,000" a year in salary. SharePoint isn't the only competency that's helping partners earn more money. Microsoft's Dynamics enterprise software line is also another technology category with a shortage of trained professionals. Specifically, people with expertise in Dynamics CRM and the AX and NAV enterprise resource planning (ERP) suites can rack up the dough from antsy employers, Edjlali says. TalentFamily even recruits non-Microsoft ERP experts because demand for people with that kind of knowledge is so high. "We go after competitors," Edjlali says. "We find ourselves finding Baan, SAP, JD Edwards people, giving them free boot-camp training that Microsoft subsidizes and pushing them into the Dynamics channel. A lot of the smaller partners don't really have a clear path for folks to groom them. They're all looking for the same thing. We've been trying to get them to open up to consider international folks, competitor folks and not just targeting the same folks." It's those smaller partners that are helping boost salaries in the channel, Edjlali says: "Sometimes the larger organizations, sometimes their benefits are a bit more extensive. A smaller company is competing against the bigger guys, so they've got to offer a little bit more to get folks to go there. At each stage, there's a little different offering to try to reach the right candidate." So what are candidates looking for, other than money? "The ability to work remotely," Edjlali says. "We've got clients that will have developers spread across the nation working from home." In terms of employees changing jobs, Edjlali says that about 15 percent of his clients will make lateral moves for the same amount of money -- sometimes to enjoy benefits like working from home -- while everybody else wants a jump in salary. That jump, he says, usually works out to a 15 percent or 20 percent boost. In Edjlali's view, IT is constantly changing and IT professionals must constantly adapt as a result. SharePoint and Dynamics are the hot expertise categories today, but ambitious employees at partner companies need to follow Microsoft's areas of focus closely and be prepared to learn something new tomorrow. "IT professionals just have to be ready to notice the market trends, pay attention to what's happening and take the skills that they have and transition to something else," Edjlali says. -- L.P. If the economy really is in recession now -- and economic growth numbers from the first quarter suggested that it's getting close -- the results of next year's survey might not be so rosy. Even Microsoft, which had been a money machine for several quarters in a row, showed uncharacteristic weakness in Q3 of its fiscal year, which ran from January through March. Profits were off 11 percent year-over-year for Redmond during that quarter; the announcement of earnings results -- which Microsoft made in late April, before it dropped its acquisition bid for Yahoo! Inc. -- sent the company's stock into a brief tailspin. 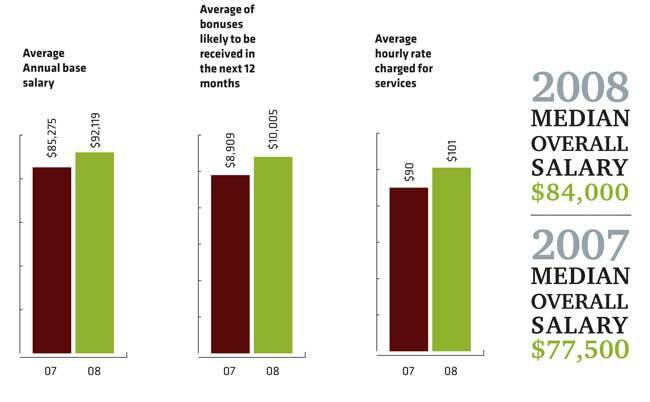 We based this report on 639 qualified responses to a survey we ran from Feb. 27 through April 1, 2008. We promoted the survey via targeted e-mails, the Redmond Channel Partner Update e-mail newsletter and our Web site, RCPmag.com. We only accepted data from respondents in the United States and Canada and from respondents who are, or who work for companies that are, active Microsoft partners. To that end, in addition to accepting responses from Registered Members, Certified Partners and Gold Certified Partners, we accepted answers from respondents who said that they or their companies partnered with Microsoft but were not formally part of the Microsoft Partner Program. However, we eliminated from our final numbers answers from respondents who said that they or their companies did not partner with Microsoft at all. Numbers may not add up to 100 percent due to rounding. -- L.P. Still, partners took this year's survey in March, when Microsoft was still in its weaker-profit quarter, talk of an economic slowdown was already rampant and the credit crunch was causing jitters on Wall Street. If partner salaries can survive the great economic scare of 2007-2008 -- and it appears that they have, at least so far -- then the future for partner paychecks could be bright indeed. So maybe that's an indicator to at least think seriously about that home renovation. For Microsoft partners, these are still good times.